Criss-Cross Tea Rose is a bed quilt pattern that's assembled by alternating two different quilt blocks from row to row and then surrounding the quilt top with two borders. One border is made from flying geese, but you can replace it with a plain border or eliminate it entirely. The quilt blocks in this quilt are called Tea Rose and Seven Grid Chain. Both are seven patch quilt blocks. Diagonal pathways are formed where 'chain' blocks meet at corners and a secondary pattern emerges when you alternate chain blocks with another design. Other chain blocks include Six Grid Chain and Single Irish Chain. Beginning quilters should understand basic skills before making this quilt. Quilt blocks finish at 14" x 14". The quilt (with two borders) finishes at about 80" x 108". Alter borders (or omit top borders) to change the quilt's size. I've split up fabrics by block to make it easier for you to alter colors. Replace with colors of your choice or combine yardages to repeat fabrics. Always make a few samples of patchwork units and quilt blocks before cutting all of the fabric for any quilt pattern. I suggest that you avoid stripes and other directional prints. If you do choose directionals, read the pattern before buying fabric so that you understand how patchwork is assembled and can decide if more fabric is required. A panel about 90" x 118", or larger depending on the type of quilting planned. The backing can be configured in many ways. See How to Make Quilt Backing to determine yardage, and remember that you could (at least in part) use leftovers from the quilt assembly to create a multi-fabric backing. About 401 inches of continuous doublefold binding to sew to the quilt with a quarter inch seam allowance. See How to Make Binding for Quilts for construction information. You might find that it is easier to work with shorter strips of fabric when you create strip sets. Use strips of the same widths but vary lengths in any way to cut the number of segments required (also helpful to make a scrap quilt). You may need one or two 2-1/2" x 2-1/2" squares, don't cut just yet. See instructions below, depends on the assembly method. See below for half square triangle unit instructions. Yes, it's a pain, but pressing to set a seam (before pressing to the side) is one way to improve the accuracy of your patchwork. Sew a 2-1/2" x selvage width black strip lengthwise to the green strip of the same size. Press seam allowance towards the black strip. The strip set should measure 4-1/2" wide along its entire length. Square up one end of the strip set so that it's at a 90-degree angle to the bottom of the strip. Beginning at the squared up end, cut as many 2-1/2" segments as possible. Make eight more strip sets from 2-1/2" wide black strips and green strips. Cut a total of (136) 2-1/2" segments. If you are short a few segments, either make them from 2-1/2" squares or construct a shorter strip set. Sew two green/black segments together to make a four-patch quilt block. Be sure to flip one segment around so that like fabrics are positioned diagonally from each other. Press seam allowance either direction or reduce bulk by fanning out the seams. Make 68 four patches from the remaining segments. Use chain piecing to speed up assembly once you're satisfied that initial units are correct. Figure 3 illustrates the half square triangle units used in the Tea Rose quilt block. There are many ways to create half square triangle units. You'll find two options below. Change cutting if you choose a different assembly method. You'll need 136 gold/background half square triangle units and the same number of blue/background half square triangle units. Each should finish at 2" square (which means they should measure 2-1/2" after assembly). I always sew oversize units and then trim them back to the correct unfinished size before sewing them into quilt blocks. Cutting instructions are not for oversize units. Add the extra to either method if you wish to trim back for accuracy (trim back instructions). If you do not sew with larger pieces of fabric, be sure to use a scant quarter inch seam allowance (a bit more narrow than 1/4") when assembling the units. Option 1: Make eight identical half-square triangle units at a time. Cut (17) 5-3/4" x 5-3/4" blue squares and the same number and size of background squares. I suggest you start with one of each to test the technique. Pair a light square with a blue square and follow my instructions for eight half square triangle units. Each completed unit should measure 2-1/2" square. Pair the remaining blue and background squares, in the same way, to make 136 half square triangle units color combo. Cut (17) 5-3/4" x 5-3/4" gold squares and the same number and size of background squares. Repeat the assembly process to make 136 half square triangle units that each measure 2-1/2" square. Option 2: Use paired squares to make the units. Perfect for scrap quilts. To use this method, you'll need (68) 2-7/8" x 2-7/8" blue squares and the same size and number of background squares. Pair a blue square with a background square of the same size. Sew the squares together twice diagonally as explained in my quick pieced half square triangle tutorial. When cut apart and pressed as shown in the tutorial, you should have two half square triangle units that measure 2-1/2" x 2-1/2". Repeat to pair the remaining blue and background squares to make 136 blue/background units. Cut (68) 2-7/8" x 2-7/8" (or larger) gold squares and the same number and size of background squares. Repeat the assembly process to sew 136 half square triangle units that measure 2-1/2" x 2-1/2". Align a gold/background half square triangle unit and a blue/bakcground unit into a horizontal row as shown. Sew the two units together and press. Align the row with the top of a four patch unit, checking to make sure that color placement and triangle angles are correct. Sew the row to the top of the four patch and press the seam towards the four patch. Arrange a background square, a gold/background triangle unit and a blue/background unit into a vertical column. Sew the pieces together and press seam allowances towards the background square. Sew the vertical column to the left of the Figure 4 unit, placing the square at the top. Press seam allowance either way. The new patchwork unit should measure 6-1/2" x 6-1/2". Repeat all steps illustrated in Figures 4 and 5 to make 68 units. Sew the 6-1/2" x selvage width dark gold strips lengthwise to opposite sides of the remaining 2-1/2" black strip. Press seam allowances towards the gold strips. Square up one end of the strip set and cut as many 2-1/2" segments as possible (probably 16). You need 17 segments. Create the missing segment with (2) 2-1/2" x 6-1/2" long rectangles and one 2-1/2" black square. Arrange four block corners, two dark gold rectangles, and a Figure 6 segment into three rows. Sew the long rectangles between the patchwork in top and bottom rows. Press seams towards the rectangles. Join the rows and press. The quilt block should measure 14-1/2" x 14-1/2". Sew 16 more Tea Rose quilt blocks. You will have enough yardage for the additional cuts that are needed. Sew a 2-1/2" x selvage length black strip lengthwise to one side of a green strip of the same size. Sew a red strip to the opposite side of the green strip. Press seam allowances towards the center strip. The strip set should measure 6-1/2" across along its entire length. Square up one end of the strip set and cut as many 2-1/2" segments as possible. Repeat to make a second identical strip set and cut more 2-1/2" segments. You need 36 segments total and are probably short by 4-5. Create the segments with 2-1/2" squares cut from the remaining strip or create a third (shorter) strip set. Multiply the number of segments needed by 2-1/2 and add a bit for squaring-up to determine strip set length. Sew a 2-1/2" x selvage width green strip lengthwise to each side of a long black strip. Press seam allowances away from the center strip. Square up. Cut as many 2-1/2" segments as possible. You'll need 18 total segments and are probably 2-3 short. Create the missing segments as explained above. Arrange two Figure 8 segments and one Figure 9 segment into rows as shown. Be sure to flip one of the Figure 8 segments around so that like (corner) colors are positioned diagonally from each other. Join the rows. Press seam allowances either direction. Sew a 2-1/2" x selvage width black strip lengthwise to one side of a 6-1/2" x selvage width light background strip. Sew a 2-1/2" red strip to the opposite side of the light strip. Press seam allowances towards the outer strips. The strip set should measure 10-1/2" across. Square up one end of the set and cut as many 2-1/2" segments as possible. Repeat to make another identical strip set and cut more 2-1/2" segments. You'll need 36 segments and are probably short by 4-5. Create the missing segments by cutting a 2-1/2" x 6-1/2" background rectangle, a 2-1/2" black square, and a 2-1/2" red square for each. If you prefer, make a shorter strip set from extra yardage as explained above (do not cut a 6-1/2" strip from selvage to selvage, because you'll also need to create extras of the next strip set, which requires 10-1/2" wide background strips). Make the last strip set by sewing a narrow black strip to one side of a 10-1/2" wide background strip. Sew a narrow red strip to the opposite side of the background. Press seam allowances towards the outer strips. Square up one end of the set and cut 2-1/2" segments. Make another identical strip set and cut more 2-1/2" segments. You'll need 36 segments and will be short a few of this type, too. Construct as explained above. Cut (36) 2-1/2" x 6-1/2" wide rectangles from the remaining 6-1/2" x selvage width background strips. You'll be a few short -- cut from extra yardage. Sew a rectangle to opposite sides of each nine patch block. Press seam allowances towards the block. Sew a shorter black/background/red segment (10-1/2" long) to the remaining sides of the nine patch. Like colors should connect diagonally at corners (shown as red to red and black to black). Press seam allowances either direction. The partial block should measure 10-1/2" x 10-1/2". Cut (36) 2-1/2" x 10-1/2" rectangles from remaining 10-1/2" x selvage width background strips. You'll need to cut a few more from extra yardage. Sew a rectangle to opposite sides of each partial quilt block. Press seam allowances away from the rectangles. Finish the quilt blocks by sewing a 14-1/2" long strip pieced segment to the remaining sides of each, again making sure that like colors flow diagonally. Press seam allowances towards the center. Each block should measure 14-1/2" x 14-1/2". 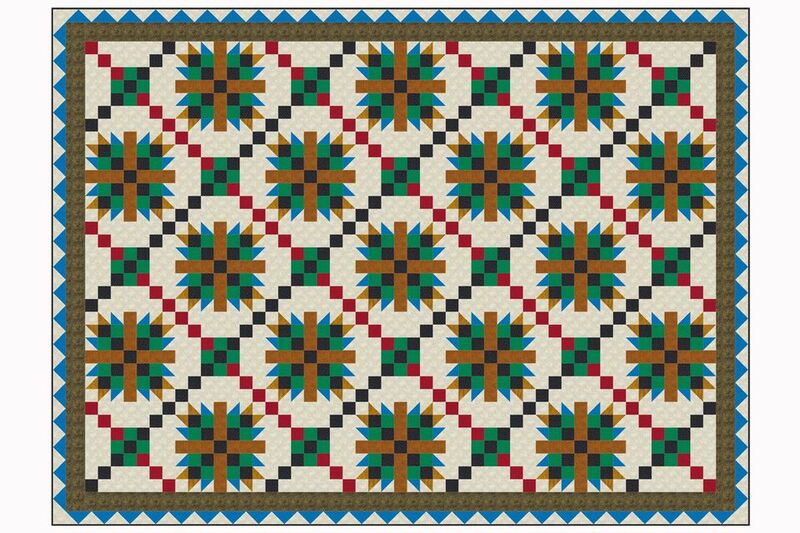 Arrange quilt blocks into seven rows, each with five quilt blocks. Rows 1, 3, 5, and 7 begin and end with a Seven Patch Chain. Rows 2, 4, and 6 begin and end with a Tea Rose quilt block. Check to make sure that like small squares flow in the same direction. Sew the blocks in each row together, carefully matching all seam intersections. Pin blocks together for best match-ups. Press new seam allowances in adjoining rows in opposite directions and join the rows. Press the quilt top. Ideally, the quilt top should measure 70-1/2" x 98-1/2". If it's too far off you will need to adjust the first border so that the outer patchwork border will fit correctly. Borders give you an opportunity to square up a skewed quilt top. If you are not accustomed to adding borders to a quilt, read my butted quilt borders instructions before you begin. Crosswise grain borders must be pieced from strips of fabric cut from selvage to selvage. If your quilt measures 70-1/2" x 98-1/2", or is very close to that size, use 3-1/2" strips cut from selvage to selvage to create the inner borders for all four sides of the quilt. Follow the instructions in the link and remember -- never measure for borders along the outer edges of a quilt. After adding the inner border, the quilt should measure 76-1/2" x 104-1/2" (a finished size of 76" x 104"). If your quilt's measurements are 1/2" or more different from the 'ideal,' adjust the border width. The goal is to create a quilt top with finished sides that can be divided by four (the finished length of each flying geese unit in the patchwork border). Use my No Waste Flying Geese Tutorial to make 86 flying geese that measure 2-1/2" x 4-1/2" after assembly. Use another construction method you wish but change the cutting instructions. Make two geese borders with 18 geese each sewn into a long string. All peaks should point the same direction. Press seam allowances either direction. Sew one of the borders to each of the quilt's two shortest sides, light peaks pointing towards the quilt top. Press seam allowances towards the quilt top. Sew two more borders with 25 geese each, all peaks pointing the same direction. You will have two leftover geese. Sew a 2-1/2" light square to each end of the long borders. Press seam allowances towards the squares. Sew a border to the two remaining sides of the quilt, light peaks pointing inward. Press seam allowances either direction. Sandwich the quilt with batting and backing. Baste the layers together with a method appropriate for the type of quilting planned. Remove excess batting and backing, squaring up corners very carefully if necessary and taking care not to trim away any of the quarter inch seam allowances along flying geese edges. Sew easy mitered quilt binding around all edges of the quilt. Use another binding method if you prefer.